In April Brichbox is celebration Royal Baby number two! Let me brifely explain what BrichBox is for those who don't know. Birchbox is a sample box, which comes with 5 sample (sometimes full size) products each month. You normally pay monthly, but I've also notice that whenever you subscribe the box is cheaper. I am so backwards with beauty boxes, as haven't been subscribed to any since mid 2013. 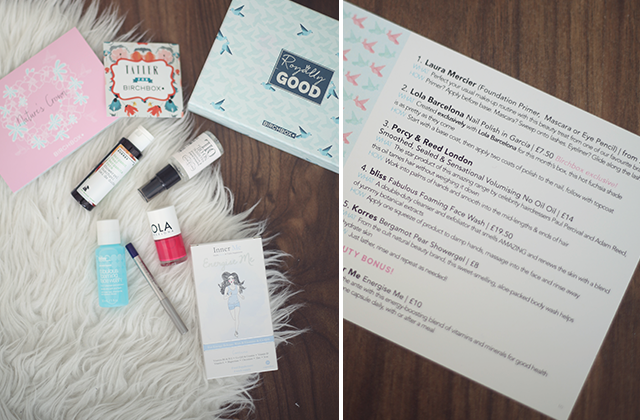 The Royally Good April Box includes 6 samples in total. Brichbox have collaborated with British magazine Talter, to create the Limited Edition box. There is also a competition, you can read more about it here. In my box I found Laura Mercier Eye Pencil, you were able to pick your Laura Mercier sample, the primer is just amazing! Lola Barcelona Nail Polish in Garcia, such a lovely colour! Percy & Reed London Volumising No Oil Oil is one of my favourite too! There was a sample of the No Oil Oil in Glamour magazine I belive last year. Percy&Reed products smell so good! I never tried anything from Bliss before, I am really excited to try out the Fabulous Foaming Face Wash! Korres Bergamot Pear Showergel smells so nice! Overall I never been a big fan of Korres shower gels. Inner Me Energise Me tablets actually do excite me. I really want to check if it will help me to became more energise. What do you think of the box? Do you like the content? I did receive the box for free, but the opinion is my own! Overall I do really like the box, might get back into the samples box, maybe not every month, but whenever I will like the theme of a box. Love that you get Laura Mercier in this one!